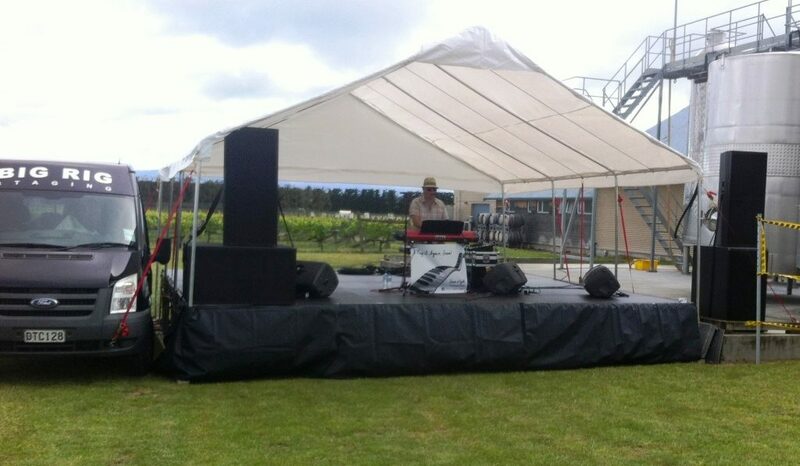 Big Rig can take the hassle out of organising the staging component of your event. We have 2 quality, professionally finished mobile truck stages, and an aluminium modular stage to choose from. Our stages are ideal for any outdoor function including community events, cultural performances, music concerts and private parties, with the modular stage also ideal for indoor use. Stages can be set up within one hour making it your first choice for community events where street closure and start times are critical. No resource consent needed!. Front trussing and roof extension are an optional extra providing complete weather protection including rigging points for lighting and signage. Trucks are also fitted with permanent lighting bars and rear acoustic stage curtains. Adjustable roof, carpeted floor, rear curtains, lighting bars, tail lifter, adjustable depth and carpeted drum riser. Carpeted floor, rear curtains, lighting bars. 1.0M x 2.0M sections: $50 + GST each. Adjustable height stairs: $50 + GST. Set up & pack down (delivery fee may apply). 14 x 1.0M x 2.0M sections. 2 x 1.0M x 1.0M sections. Adjustable height from 300mm to 900mm (easily set up on uneven ground). Total stage size: 5 x 6M. Our newly modified 1977 retro caravan opens up to become a mixing booth for outdoor events. Protecting operators and equipment from the elements, set up time is as little as five minutes. 2.2M wide x 3.3M long.